When last we visited with our friends from market research firm ChangeWave Research, they were reporting on big gains for the iPhone in the smartphone market, in the wake of the iPhone 4’s release. As that excitement has subsided, however, it appears that Android is continuing to make big gains among consumers. The company’s most recent survey, concluded September 23, talked to 4,000 respondents. 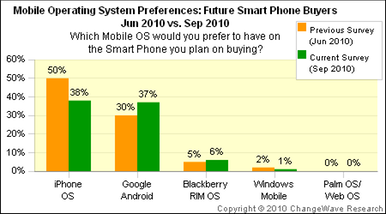 Of the ones planning on buying a smartphone in the next 90 days, 37 percent said they would favor an Android unit, up from 30 percent in June. The iPhone, however, just squeaked into first place with 38 percent saying that Apple’s device would be their choice—and that’s down significantly from 50 percent in June. BlackBerry got a slight bump from 5 percent to 6 percent, while Windows Mobile lost ground from 2 percent to 1 percent, and Palm’s webOS stayed even at a nice round 0 percent. In terms of satisfaction, ChangeWave’s numbers jibe with recent figures from J.D. Power; 74 percent of iPhone owners say they’re very satisfied with their phone, compared to 65 percent of Android users, 32 percent of webOS users, 31 percent of BlackBerry users and 24 percent of Windows Mobile users. As manufacturers release more and more Android units, the iPhone is certainly feeling a squeeze, but the drop in purchasing plans seems to be related more to the initial rush of the iPhone 4 cooling off than any issue with the phone—perceived or actual. A previous ChangeWave study showed that the iPhone 4 antenna problem had not been a significant deterrent to iPhone owners. So while Android may be making gains, the iPhone’s higher customer satisfaction ratings appear to be helping keep it at the top of the heap—at least for now. ChangeWave’s next survey, likely due in December, will tell us more.